This printable coupon book for Valentine’s Day is a great way to give your spouse a totally free to you gift they will love. The items in this printable include fun things like a massage or a date night, but it also includes a page that is blank for sharing those fun little intimate things that only you and your spouse would know and enjoy. 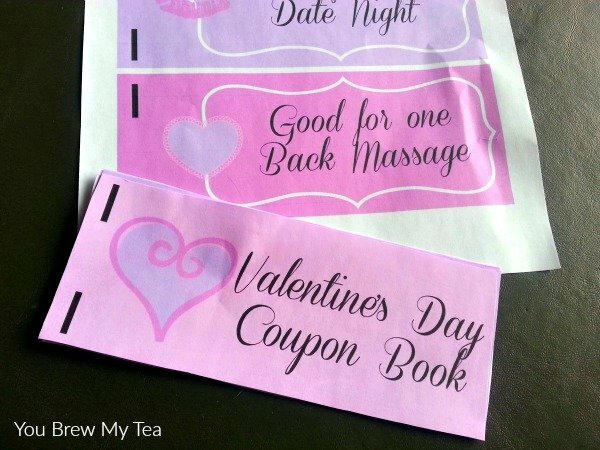 For a cute and cheap Valentine’s Day gift, this coupon book is a great printable that is easy to put together! With this coupon book, you can easily customize some fun and easy ways to give something back to your spouse. Some fun suggestions below are what many on our Facebook community have said would make them feel loved and important. An hour bubble bath alone without interruptions. An hour to just read quietly while you care for kids. A dreaded chore being taken care of for the day. An early bedtime after a long day while the other person takes care of kids baths an bedtime. A favorite craft beer with dinner. A night out with the guys with no curfew. To watch the football game without being interrupted. A DIY project completed without having to nag. Netflix and chill after the kids are in bed. Watch a favorite movie (chick flick, action movie) without falling asleep. Take the kids to the park so your spouse can have quiet time. Give a full body massage without expecting “anything”. Clean out the refrigerator – not just throwing food out but really clean it with soap and water. Clean the litter pans or take the dog out for a walk. Listen for an hour to your spouse talk about anything on their mind – without interruptions, judgements or advice – just listen. Diaper duty for a week (changing them and taking out to the garbage). Pay for a pedicure or manicure. Go to the electronics or hobby store with your husband and let them browse for hours. Go shopping with your wife and let them browse for hours. Go “parking” in the car in your driveway. This list is just a few of the things our readers thought would be great to add to a romantic Valentine’s Day coupon book. 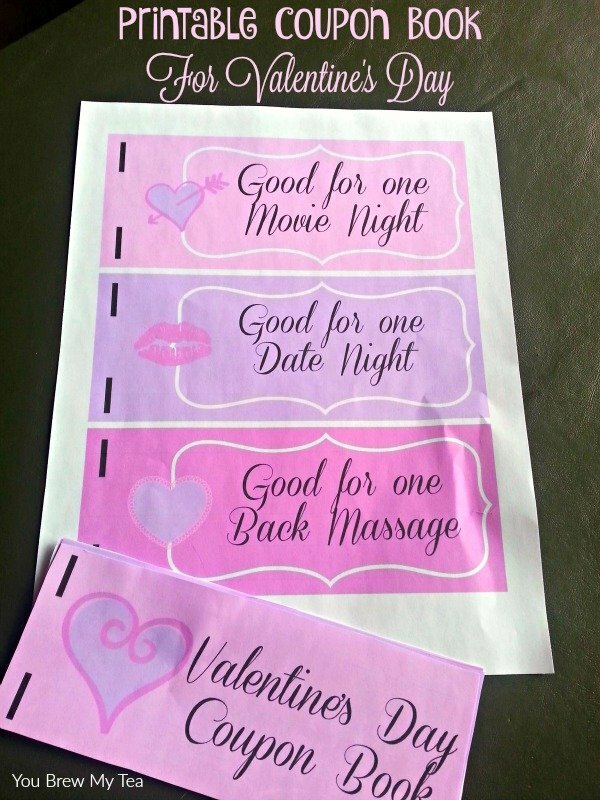 Since this one comes already loaded with a few of these things, you can use the rest of the blank coupon pages to create fun things that would suit your significant other. Print this coupon book easily below. Spend a few minutes to cut it out, then string together with some pretty twine or ribbon. Alternately, you could easily staple together if preferred. Whatever works best for you. Just make sure it is easily secured and set up to give your spouse on Valentine’s Day. Add this simple printable coupon book for Valentine’s Day to their pillow while they are in the shower, into their bag or briefcase as they head out to work, or even in their lunchbox for later in the day as a fun and nice surprise to go along with other gifts or special meals created for Valentine’s Day! Check out some of our other favorite Valentine’s Day ideas!